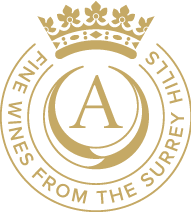 Longwells is a small vineyard on the Surrey / Sussex border at the foot of the Surrey Hills. The vineyard comprises two acres of Seyval Blanc vines, managed sustainably by the Albury team. Longwells Reserve is made from 100% Seyval grapes from the 2015 vintage. It is a fresh, crisp, dry sparkling wine with ccitrus and herb aromas.